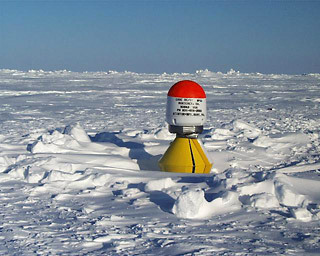 Associate Research Professor Tim Stanton and his research group from the Naval Postgraduate School have developed ice-deployed drifting buoys which measure vertical fluxes (a movement of a property, such as heat, measured over time) of momentum, heat and salt in the upper ocean. These measurements are critical in determining changes in ice cover, thickness and heat content, and ocean heat. These different factors interact over seasonal scales to maintain ice cover in the Arctic.